This is another Michigan weekend bike touring post… Looking at trails around Grand Rapids, I was able to route a 3-day bike touring loop. The trip would start in Grand Rapids. From there we would ride to Holland. 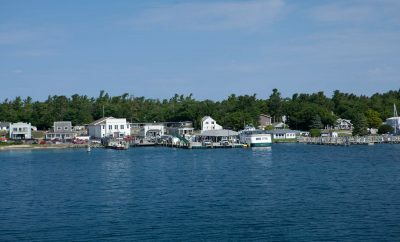 The following day – to Muskegon, and then return to Grand Rapids, on the last day. The problem with trails in Michigan is that even though we have many, they are rarely connected into continuous routes from city to city. So, my route had to include many local roads to connect everything into a continuous loop. I did not find many people interested in the trip. Only one friend decided to join me… Friday morning, we drove to Millennium Park in Wyoming, just on the southwestern edge of Grand Rapids. This is where I decided to park the car. You have to be careful, when leaving your car parked somewhere overnight, and be sure that it won’t get towed away. I called the park, and they assured me, that since I let them know, I can leave it in the park overnight. When we got to the park, we decided to confirm it with the police and quickly located a patrol car. The policeman was a little surprised when we explained, the we are going for overnight bike touring, but directed us to a parking lot. This is something that I encounter often, when touring in Michigan. Since the state is not on any major cross-country bike routes, you don’t see many bike touring people in Michigan. So, you always have to check if you can leave the car overnight, as many municipalities have restrictions. We parked the car, put our gear on the bikes and took off. Even though it was still Spring, and only second week of June, it was a hot day and we had about 45 miles to go. We rode park trails to connect with Kent Trail on the south side of Grand River. Then we rode trails and many local streets in the general southwest directions. I will not bore you here with all the little streets, roads and trail sections that we rode on. I planned the route based on amount of traffic, availability of wide shoulder or sidewalk, etc. If, you are interested in route details, send me a message and I will email them to you. We went through Jamestown, and west of it finally got on the Fred Meijer Kenowa Trail going west. 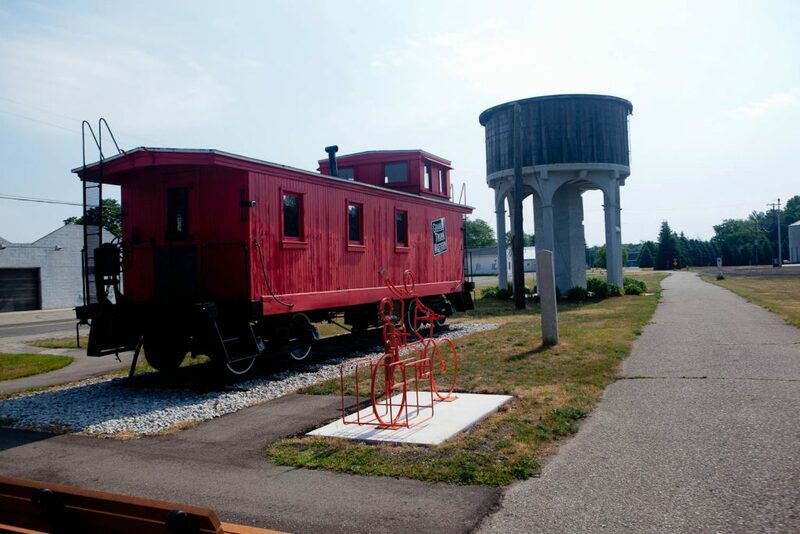 After few miles on the trail, east of Zealand, on the western side of Macatawa River, Fred Meijer trail connects with Upper Macatawa Natural Area Trail. The trail ends at Adams St. From there we followed Adams St west, and few other local streets all the way to downtown Holland. So far, we covered about 35 miles. 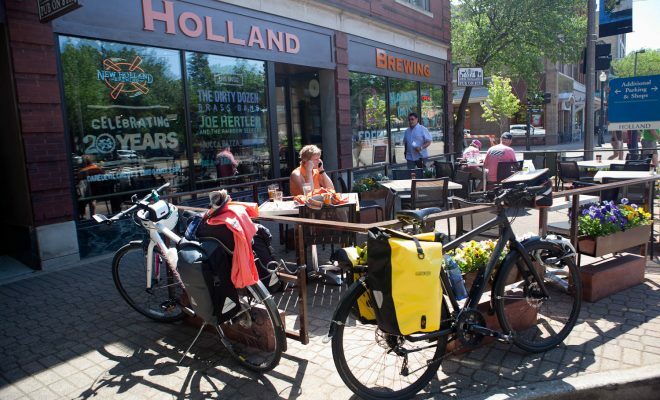 We stopped to rest and for lunch at New Holland Brewing on College Ave, south of E 8th Street. 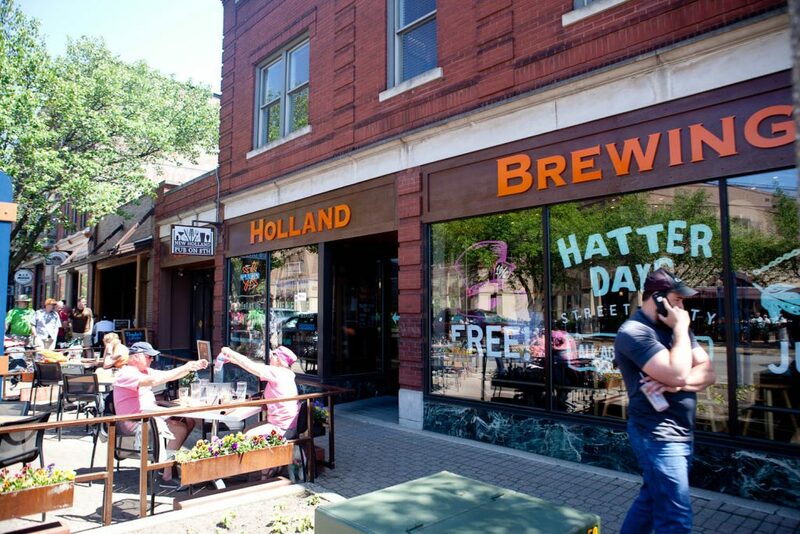 After a good meal and a rest, we hopped back on our bikes and continued north to cross the river and the ride west along Douglas Avenue and then Ottawa Beach Rd, or really a trail along, all the way to Holland State Park Campground. Camping in Holland State Park. It was late afternoon, and we had enough time to setup our tents and relax for a while. Later we rode to the beach to spend a little bit of time by the lake, and to check out the Big Red – Holland lighthouse. 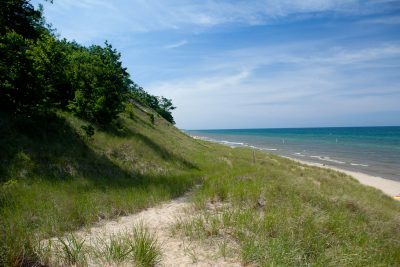 One note about the Holland State Park campgrounds. There are two separate sections. 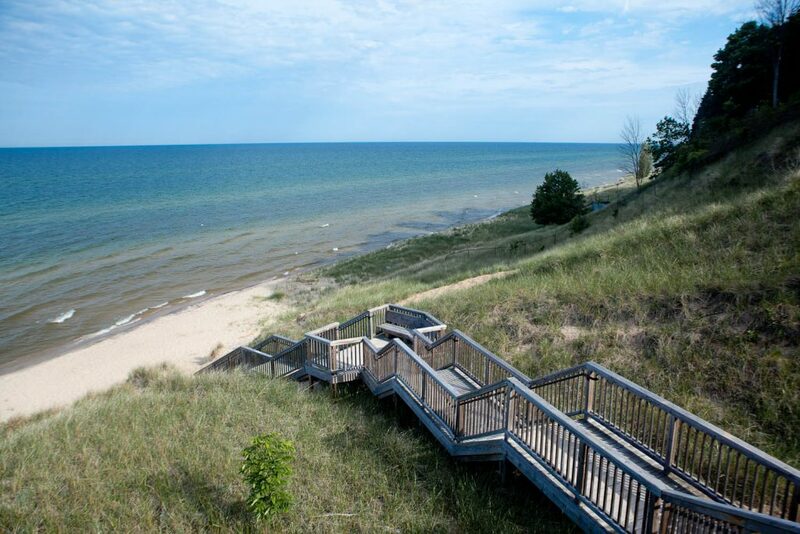 Beach section is completely paved and surrounded by sand dunes. It’s not suitable for tents, but for RV’s and campers. The Macatawa section located about half mile away from beach is a regular grass covered ground campground. This is where we camped. “Big Red” – Holland Lighthouse. Summing up today’s route, it is difficult to say how many miles were trail and how many road, since I did not track it. But I would say, that we spent less than 50% time on the trails. The morning was nice and cool, and we left the campground early. We just ate some snacks and decided to have breakfast in Grand Haven. Just north of the campground, we got on Lakeshore Dr, and then immediately on the Lakeshore Trail that follows the road. After just two miles, we got to Tunnel Park, which has a really nice beach. We did not stop there though, since we just started riding few minutes ago. Lake Michigan, viewed from one of the roadside parks. 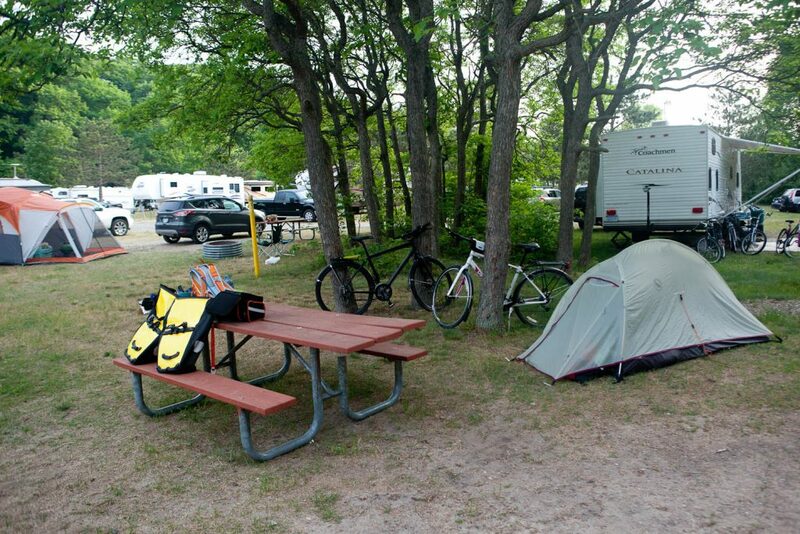 Today, we did not need to hurry, having only 30 miles to ride to our next campground in the vicinity of Muskegon. After going for a while, we stopped to rest in Kouw Park, which is one of those small roadside parks. We took a short break, and continued north. On the way, there are few more places for possible rest stops. First, there is Kirk Park. Next – Rosy Mound Natural Area. Trail finally ends at the intersection of Robbins Rd and Sheldon Rd. From there we followed the road north. In half a mile we passed another park and possible rest stop at Duncan Woods. When we reached Franklin Avenue, we took it west till we got to South Harbor Dr. We rode north and stopped almost immediately at Kriby House, where we finally had breakfast. After the break, we went across the street to the waterfront and the trail following it. 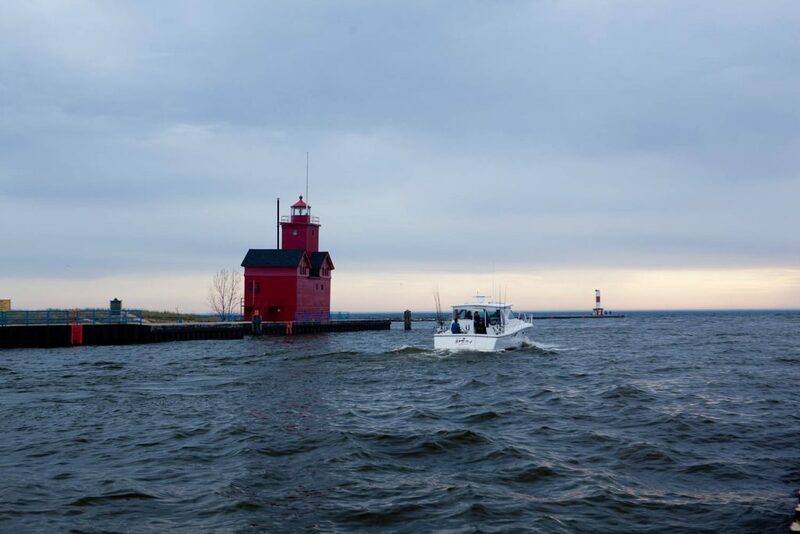 Like almost every town along the lake, Grand Haven, has a lighthouse. 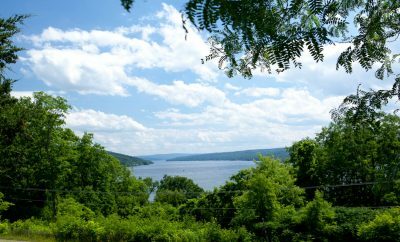 If you would want to visit it, you need to follow the shoreline south for about half mile. Both of us seen the lighthouse many times, so we continued north along the waterfront. We followed it all the way till N 3rd Street, which we took over the river. Then Coho Dr till Harbor Island Dr and another bridge over the river. Then trail and few streets till we ended up on 174th Avenue going north. Later – Dogwood Dr, Hickory St, and finally E Pontauna took us all the way to PJ Hoffmaster State Park campground. We setup our tents. Took shower and relaxed. We had plenty of time left. If we were here later, in the summer, it would be a good idea to go to the beach and for a swim. However, in late May the lake is still way too cold. In the evening, we rode up to south side of Muskegon to eat. So about 6 miles north from the campground. 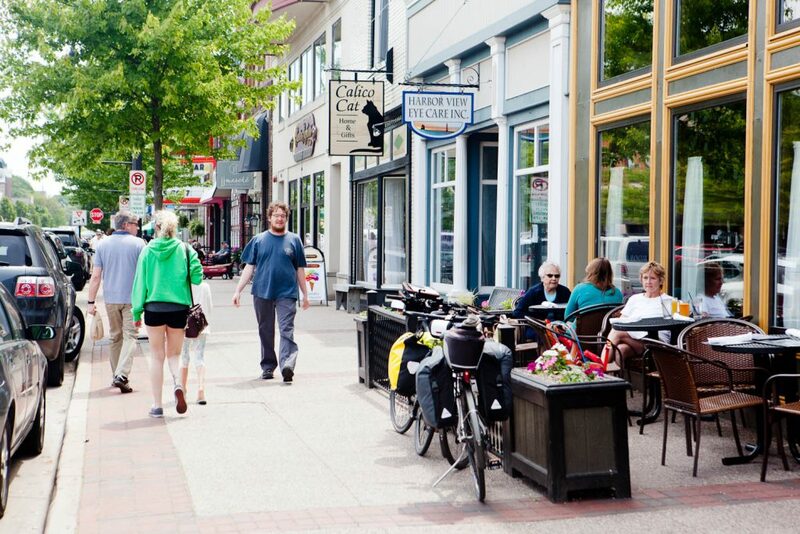 You’ve got to remember that this is Michigan, the automotive state, so everything caters to the motorized tourist. For that reason, there are almost no places to eat close to the campground. From the campground we rode along Pontaluna to Fruitport and stopped at the diner for breakfast. After breakfast we continued east. However, we had to drop south to Fruitport Rd to get to the other side of I-96. From there we made our way northeast. You want to avoid Hilton Park Rd, which is a dirt road, and not very smooth. Eventually, few miles north, we finally got on the Musketawa Trail, which would take us back to Grand Rapids. One of the bike trail attractions. The trail is pretty nice. Don’t expect much traffic on it. It mostly goes through woods and farm fields. It passes through few small towns. Therefore, there are not many places to stop for lunch. One that I found, would be in Ravenna. We did not stop for lunch. We just snacked on granola bars and stopped to get something cold to drink in Conklin. 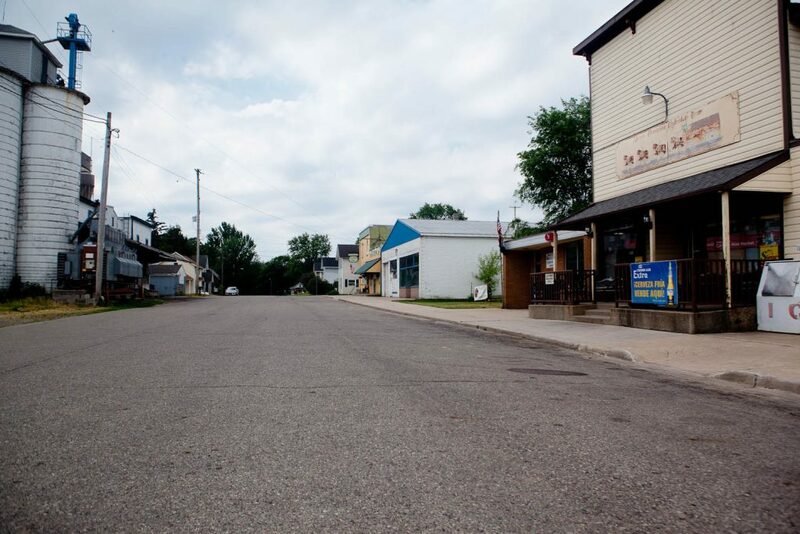 A forgotten by time, small town with one store and one bar. Finally, at Fruit Ridge Ave, we left the trail and began riding south towards the Millennium Park. Shortly, at Justin Avenue, we got on a bike trail again, which took us all the way to the park. In the park, we followed Fred Meijer Millennium Trail along Maynard Ave southwest till we got to the parking lot where we left the car. This concluded our 3-day tour. It was a scenic, in some parts, nice and relaxing loop. I would not recommend it for somebody, who just wants to get on a trail and ride. At times, it requires full attention of the rider, as the route switches from street to street and road to road. 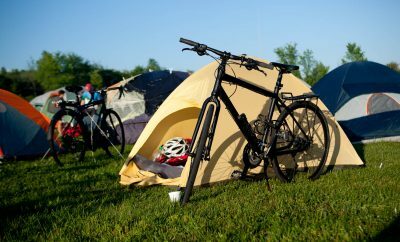 Weekend Bike Touring in Michigan – Tip of the Thumb.